Daily Illuminator: Super Summer Game Day Locations! July 12, 2017: Super Summer Game Day Locations! Want to learn to fly or use a utility belt? Perhaps you already know how but you can't tell anyone about it, so it's really lonely? 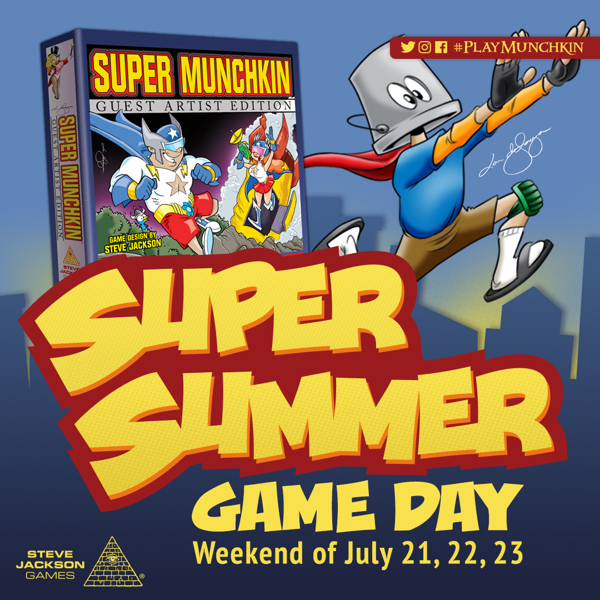 Come join some like-minded individuals at a #PlayMunchkin Super Summer Game Day! Two hundred stores around the U.S. and Canada will be hosting game days for playing Super Munchkin Guest Artist Edition, drawn by Lar deSouza, a game where heroes get powers and gadgets to fight villains – and, of course (since this is Munchkin), to betray one another! Most events will be held the weekend of July 22, but call your local store ahead of time to confirm the exact date and time of their super soirée. Each event will feature demos of the game, plus plenty of promo cards and bookmarks with special Munchkin rules on them. And remember, when you're trying out the game, post photos to social media with #PlayMunchkin. Tag @SJGames on Twitter and Facebook, and @SteveJacksonGames on Instagram, and you'll be automatically entered to win prizes. Tag the store in the post, too, so the store will be entered to win a separate retailer prize. Here are all the super event locations.